For HP, Dell ,Toshiba. 100 x Screws 2.5". Great for DIY Project. We might require you to send us photo/s of the item received and also your original item so we can compare and conduct necessary actions. 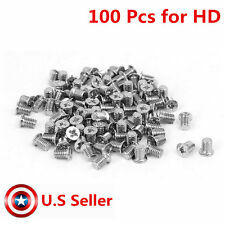 New Lot 100 pcs Laptop 2.5" HDD Hard Drive Caddy Screws for Dell HP TOSHIBA ......DESCRIPTION Specifications & Features - Brand new in perfect condition. 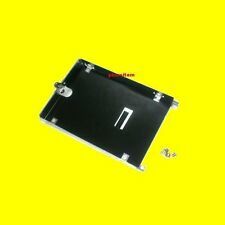 - It is very convenient for you to repair the laptop. - Machine Screws below for you choose - M3 Phillips Wafer Flat Head Screws: M3 x 3 mm, M3 x 5 mm - M3 Phillips Round Washer Head Screws: M3 x 6 Compatible with - Universal Hard Drive HDD or SSD PAYMENT ---We accept Paypal payment only. ---We will only ship to PayPal's Confirmed Address. ---8.75% CA Sales Tax will be applied to residents of California State. SHIPPING ---Items are usually shipped out within 24 hours during the business days after payment has been received. ---All shipments will include Delivery Confirmation Number or Tracking Number. ---Buyer is responsible for Duty. Specifications & Features Brand new in perfect condition. It is very convenient for you to repair the laptop. Machine Screws below for you choose M3 Phillips Wafer Flat Head Screws: M3 x 3 mm, M3 x 5 mm M3 Phillips Round Washer Head Screws: M3 x 6 Compatible with Universal Hard Drive HDD or SSD. HP EliteBook 8440p 8440w. This hard drive caddy is an important accessory for your beloved laptop. Featured with plug and play installation, this hard drive caddy is easy to use. In addition, it is with modular construction, you can just remove the CD driver and put this in the slot. 100 screws for Laptop 2.5" Hard Drive Caddy Screws. IBM thinkpad 3X3 MM. Available color: Black. Note: Colors may vary. For More, Link Below. Have a 1 to 5 year warranty program. Compatible with. HP Compaq 8440p 8510 8510p 8510w 8530p 8530w 8540p 8540w. EliteBook 2540P. 1 pcs HDD Caddy 4 Screws ( connector are not included ). HP Compaq 6510 6510b 6515 6515b 6520 6520s. HP Compaq 6710 6710b 6710s 6715 6715b 6715s 6720 6730 6730b 6730s 6735b 6735s 6820s 6830. 100 screws for Laptop 2.5" Hard Drive Caddy Screws. Available color: Black. Note: Colors may vary. 100% Authentic. Have a 1 to 5 year warranty program. 10 x Dell Latitude E6320 E6420 E6520 Laptop Hard Drive Caddy Covers Screws. E6320 E6420 E6520. Take Note! (This is different from part number: 7G4VK hdd cover). We will do our best and help you provide the solution. For Dell D1440. for HP NC6400. 100 x Screws 2.5". Great for DIY Project. We might require you to send us photo/s of the item received and also your original item so we can compare and conduct necessary actions. Trending at $3.09eBay determines this price through a machine learned model of the product's sale prices within the last 90 days. 100x Hard Drive Caddy Screws. 100 screws for Laptop 2.5" Hard Drive Caddy Screws Note: Colors may vary. IBM thinkpad 3X3 MM. Compatible with. Model: for Latitude E6400 E6410. 2 X Screws. Plug and play, easy to use. Modular construction, you can just remove the CD driver and put this in the slot. Quantity: 1 Set. Due to the difference between different monitors, the picture may not reflect the actual color of the item. DELL Latitude E6510 will Fit 2.5" IDE Laptop Hard Drive. Compatible Models: Dell Latitude E6510. Type: Hard drive caddy cover. 10 x hard drive screws. 5 x hard drive cover. Give us a chance to make things right for you, and we will do our best to provide a fitting solution. Trending at $6.99eBay determines this price through a machine learned model of the product's sale prices within the last 90 days. Universal Hard Drive HDD or SSD. - Machine Screws below for you choose. Trending at $4.76eBay determines this price through a machine learned model of the product's sale prices within the last 90 days. 100 screws for Laptop 2.5" Hard Drive Caddy Screws. 1x Hard Drive Caddy Screws. IBM thinkpad 3X3 MM. The color difference is hard to avoid in the internet sales. So if dear you can not accept this very little difference, be cautious before you making the orders. 3 screws (HDD to caddy only). Hard drive is not included. Connector is not included. Compatible with: for Dell Latitude 7450 E7450. Size: fits for Dell Latitude E7450. Item Type: Hard Drive Caddy Bracket. 1 X Hard Drive Caddy Bracket. As laptop accessory to replace the broken parts. Dell Latitude. Give us a chance to make things right for you, and we will do our best to provide a fitting solution. Compatible Notebooks :Dell Latitude E6320 E6420 E6520. Compatible with Dell Latitude E6320 E6420 E6520. Warm Tip: Due to the light and screen setting difference, the item's color may be slightly different from the pictures. These are the correct length for all notebook hard drives; make sure you don't buy screws that are too long. These will work for all 2.5" SATA and PATA laptop hard drives. 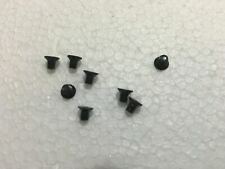 Lot of 50 Notebook/Laptop 2.5" Hard Drive Screws. Compatible Notebooks :Dell Latitude E6320 E6420 E6520. Compatible with Dell Latitude E6320 E6420 E6520.